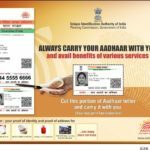 Recently, I attempted a tweetstorm on why I think the 2016 Aadhaar Act does not override, or render useless, the orders passed in Oct 2015 by the Supreme Court. I argued that all of the recent notifications by various central government authorities making Aadhaar mandatory to avail the respective service of those authorities, are in manifest violation of the Supreme Court’s orders. This post is to explain those points in a little more detail and provide a rebuttal to counter-views that are being tweeted out such as this. Here is a brief timeline of the events leading up to the recent Govt. notifications making Aadhaar mandatory for availing for services like food grain under PDS, mid-day meals for school children, girls rescued from human trafficking and many others. The unique identification authority of India (UIDAI) was established by an executive notification in January 2009 and had been running/overseeing the operations of data collection, enrolment, deduplication through biometrics, assigning of Aadhaar numbers. It also provided Aadhaar authentication and related services. The authority operated under executive notification until it was reincarnated into its present statutory form after the coming into force of the 2016 Aadhar Act. The lack of competence, under the constitution of the union executive in operating the project. Supreme Court passed the first interim order in the matter in September 2013 prohibiting any government body from insisting Aadhaar as mandatory for any of its services irrespective of any circular or notification that may have been issued in that regard. 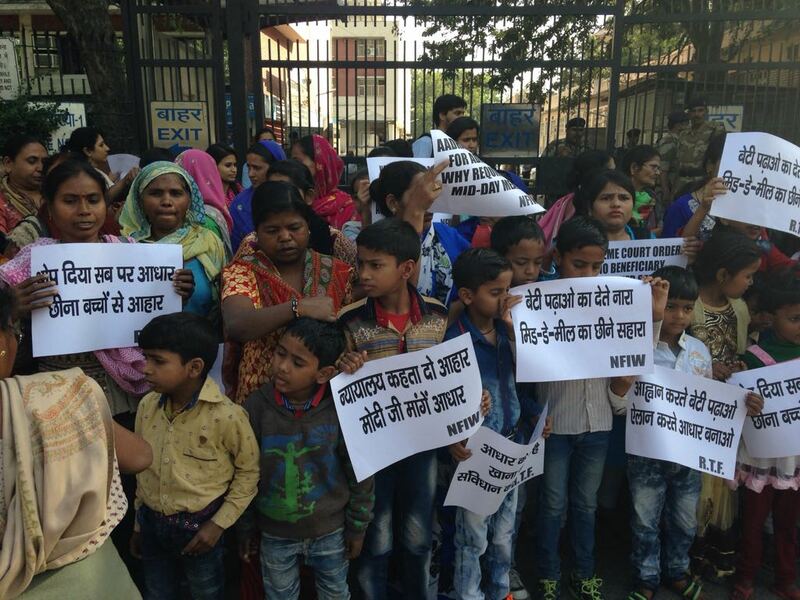 It reiterated that position a number of times thereafter – November 2013, March 2014, March 2015, August 2015 (after Attorney General for India famously claimed before the Supreme Court, the highest constitutional court of the land, that Indian citizens do not have the right to privacy under the constitution and the matter was sent before a constitutional bench of a minimum of five judges, even as the matter raised grave questions of constitutional interpretation and is “of some urgency”) , and again in October 2015. The August 2015 order limited even voluntary use of Aadhaar to two schemes viz PDS and LPG. The October 2015 order permitted four more schemes for voluntary usage of Aadhaar. The October 2015 order categorically made it clear that Aadhaar scheme shall be “purely voluntary” until the matters are finally heard and decided one way or the other. In March 2016, Aadhaar Act was passed as a Money Bill, bypassing the Rajyasabha. The unconstitutionality of such introduction and passage has also been challenged in the Supreme Court and that challenge has also been admitted and tagged along with earlier petitions before the SC. Starting January 2017, more than sixty different government authorities issued notifications under Section 7 of the Act, apparently making Aadhaar mandatory for various purposes. The primary basis of a court passing an interim order is the pending dispute before the court. As long as such a dispute is still pending, the orders would ordinarily hold force. In this case, the petitions are still technically pending before the Constitution Bench of the court, even if the Govt thinks they have become infructuous/ useless. The government has not moved the court for such a declaration or dismissal of the petitions or vacation of the orders citing the new law. Note that this case is different from instances like the Shah Bano story in which a final judgment of the court was sought to be undone by an Act of parliament. 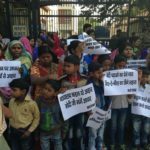 In this Aadhaar case, the central government is still before the court and is subject to the jurisdiction and specific restraint imposed by the court. If any authority wants to exercise power, (even newly found power) contrary to such restraint, it cannot do so without the permission of the court. It is impossible for a person to comply with the later legislation as well as the orders of the court. In this case, the Act has neither of these ingredients. While Section 7 confers power on various authorities to insist on Aadhaar as a mandatory pre-requisite, it does not impose a duty to do so. The authorities therefore can comply with the Act without being in contravention of the orders of the court, by simply not exercising the powers under Section 7. If any authority is desirous of exercising the newly found power, they can do so – but only with the leave of the court. Moreover, when the interim orders were passed, the absence of law was not the only issue in consideration. In fact, the central government had argued that the Appropriation Act at the time read with Allocation of Business Rules under Article 77 provided the legislative basis for the project and that IT Act and the Rules under IT Act have enough statutory safeguards for data protection; and therefore there was no legislative vacuum under which the project was operating. Government of India, and others seem to take a view that the 2016 Act did not exist before October 2015 and that there is no principle of automatic stay of an Act of parliament that did not exist at the time of passing the order and therefore, October 2015 order would not prohibit authorities from exercising power under Section 7 of the newly enacted Act. That argument does seem to be appealing on the face of it. However, a plain unqualified application of that argument leads to absurd results. Assume for one moment, that the 2015 Act did stay the operation of a law – lets call it Aadhaar Act-1. Say parliament passes another identical Act and lets call it Aadhaar-Act-2. Can the government continue to implement and enforce Act-2 believing that there is no automatic stay? Such a result would be absurdity. Why have constitutional courts at all if legislatures can simply reiterate their earlier position and escape orders of such a court? My point is that the question as to whether or not an earlier interim restraint prohibits persons from exercising powers under a future Act depends on the facts and circumstances under which the earlier orders were passed and the contents of such future Act. For instance, SEBI applied to the Court to modify the 11th august order complaining that the 11th August imposed a restraint on its statutory powers even though they were not in challenge before the Court. On the face of it one may argue that there is also no principle in constitutional law to put restraints on statutory powers when such a statutory provision is not under challenge. But the court did not accept such a contention in its 15th Oct 2015 order and disallowed SEBI’s application. I also argue that the Act was incorrectly introduced and passed as a money bill in the parliament in brazen disregard for the qualifications of being a money bill under Article 110 (3) of the Constitution and in glaring violation of the principle of Federalism, which is a part of what is called “Basic Structure” of India’s constitution. I am of the view that the Act is still-born and people are not bound by it. Note that this is different from an Act which is contrary to provisions of Constitution such as any fundamental right etc. In such a case, people are required to act as though they are bound by it until such a law is declared unconstitutional by the court. However, because this Act is no valid legislation at all i.e. it is void ab initio, people are free to act contrary to it. It is no different from a random resolution passed by your neighbour’s family – to give a crude example 😉 Prasanna S is one of the advocates acting for some of the petitioners in the Aadhaar petitions before SC. While one can understand the urge of our PM to clean the Augeans stables of corruption, nepotism, treason etc one is skeptical if he is aware of the fact that such a scheme was tried out in the US of A, UK and Australia with a fraction of our population and much, much better off economically. And the reason they had given it up had to do with privacy and economy issues! And ours is a country that has been sustaining a PDS, since independence till date, and still unable to issue ration cards correctly! For those of us who don’t want to apply for Aadhar, how do we go about filing taxes now at the risk of our Pan card getting invalidated?